Baseball, and Summer, and...Potato Salad? Today is the opening day of baseball season. And if baseball is here, can Summer be far behind? With that happy thought, allow me to extrapolate. 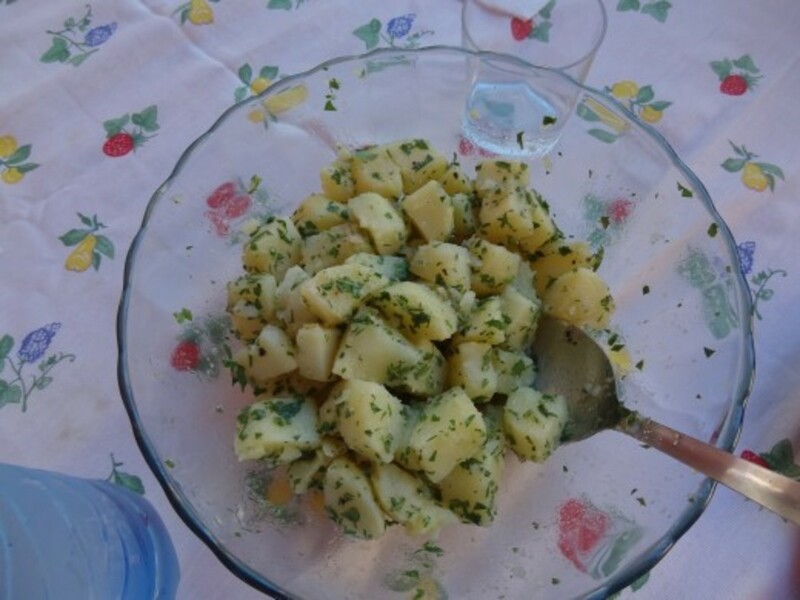 If Summer is near, we must have potato salad. Perfect potato salad. 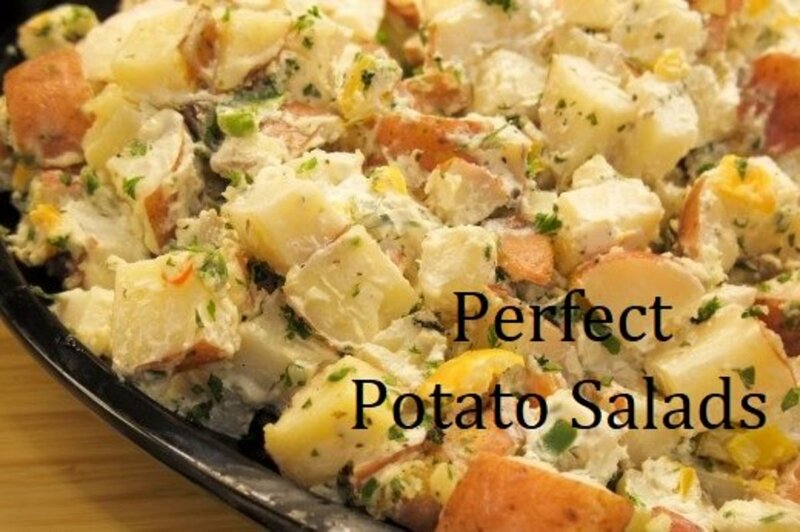 But what is the “perfect potato salad”? Is it tangy with vinegar, or bright with yellow mustard? Perhaps the contrast of textures is what you love—creamy potatoes and crunchy vegetables. Or do your thoughts go to something even more exotic? 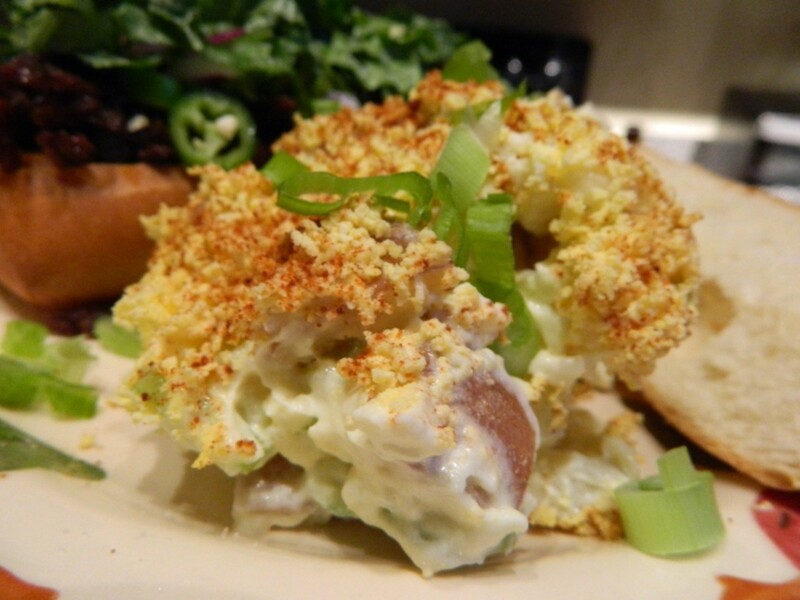 I can and will help you find your perfect potato salad Muse. What are the components of a basic potato salad? Well, potatoes of course (duh! ), a dressing, and flavorings. Sounds simple enough. So let’s look at each of the components. Starchy—these are the the bakers, the ones that are are high in starch and low in moisture. When cooked they become fluffy, creamy, and absorbent. They are great for boiling, baking, and frying, but they don’t hold their shape when cooked and diced. However, that absorbent aspect makes them a possible candidate if you want a potato salad that is creamy and full of flavor. All-Purpose—On a scale of 1 to 10, with ten being the potato with the most starch (this means sticky), starchy bakers are 10, all-purpose are a 5 (medium starch). In the words of Martin Luther “What Does This Mean?” Well, it means that like starchy potatoes they cook up tender, but they also hold their shape. The all-purpose potato is your perfect choice for preparing just about any potato dish. However, the skins can be a bit tough, so if you use them for potato salad, you might want to remove the skins. Waxy Potatoes—They have a low starch content, so they cook up firm and moist. If you remove the skin they will absorb more dressing, but leaving the skin on adds a nice color to what might be an otherwise monochromatic salad. Place your potatoes in a large pot and cover with cold water—the water should be one inch (more more) above the potatoes. Add a liberal amount of salt (about 2 teaspoons). This won’t make your potatoes taste “salty”, it will just make them taste like amazing potatoes. Bring the potatoes covered in water to a boil, and then reduce the heat to simmer. (Don’t boil them—if they bang and crash into each other they can break). Use a sharp paring knife (not a fork) to test for doneness. Use the tip of the knife to poke the potato—if it pierces easily and does NOT cling to the knife when you lift upward, the potato is done. 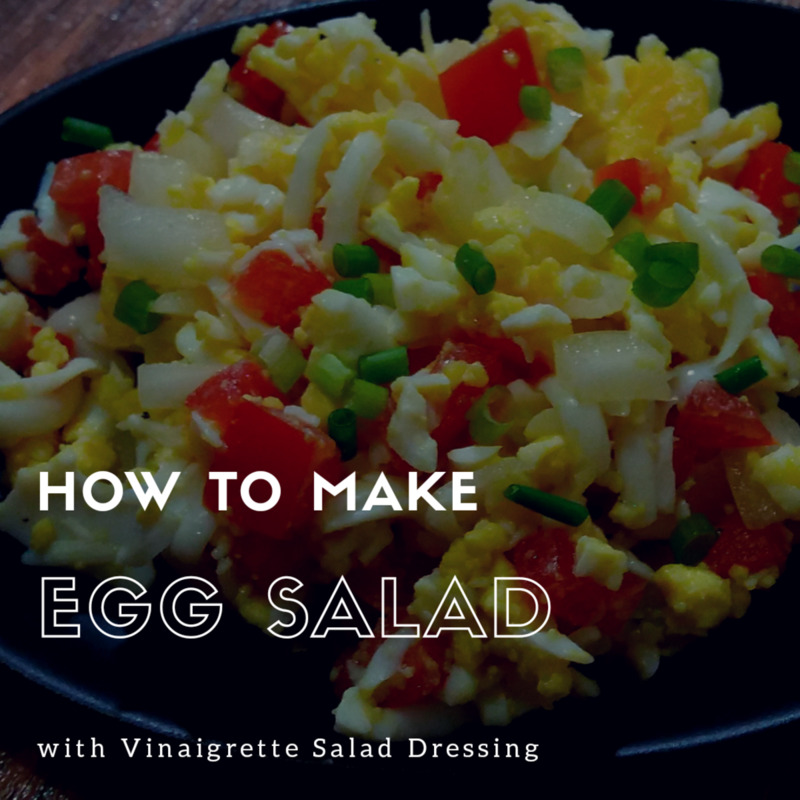 Dressing is the glue that binds together your potato salad. 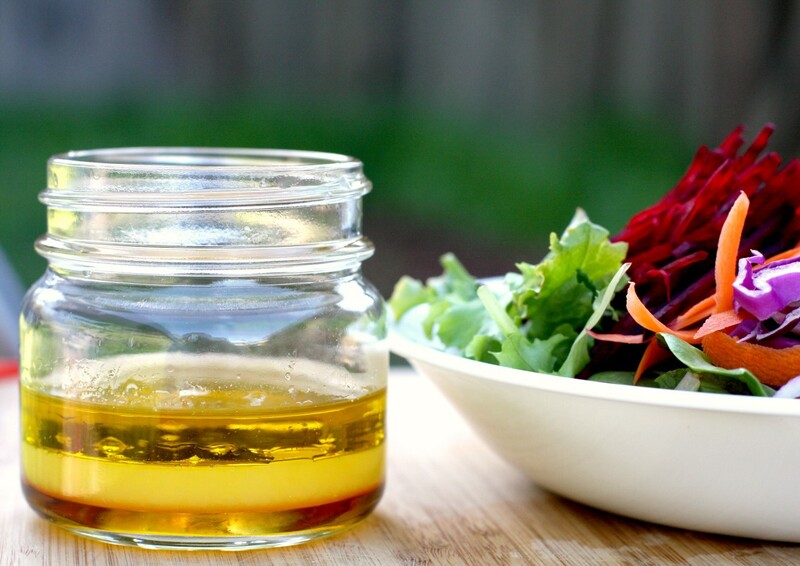 Mayonnaise, sour cream (or yogurt), and vinaigrette all impart special flavors to your salad. I like to use a combination of all three. Mayonnaise lends a silky creaminess, sour cream is tangy, and the vinaigrette reduces or eliminates the need for additional salt. (OK, I know that potato salad isn't meant to be a health food, but reducing sodium is never a bad thing). Hot potatoes absorb liquid, so add your vinaigrette while the potatoes are still warm. The flavor will penetrate deep into your potatoes, making every bite tangy and tasty. There are so many options. My mother always added finely diced dill pickle and red radish, chopped hard-cooked eggs, and a dash of dried dill weed (or fresh dill weed when available). In the recipes that follow I will provide suggestions for using those and other additions. 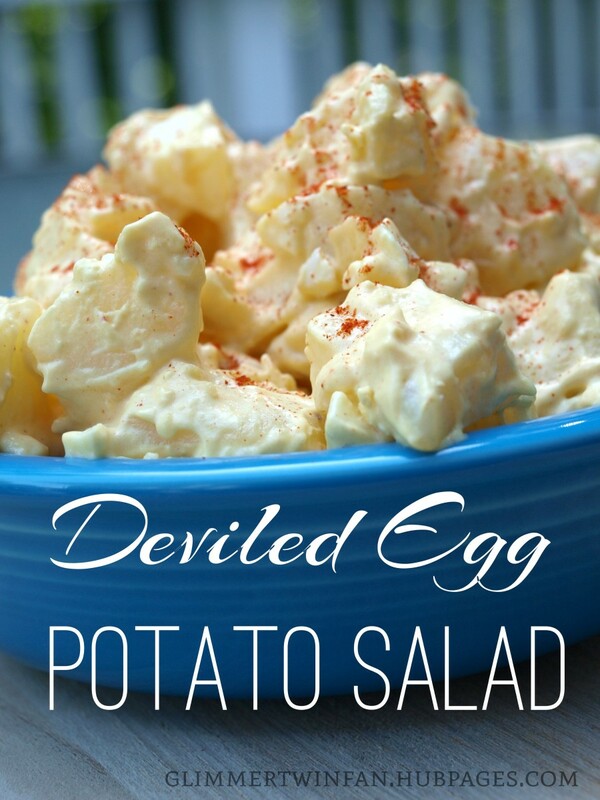 This recipe is adapted from the “Classic Potato Salad” by Betty Crocker. 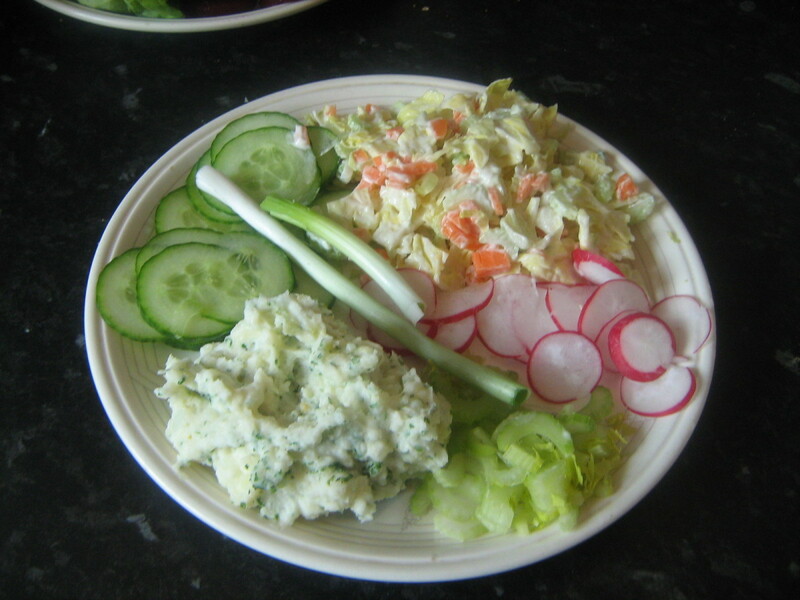 I have included the sour cream, dill pickles, and minced radishes that my mom always used in her potato salad. Cook potatoes according to directions given above. Combine mayonnaise, sour cream, vinegar, mustard, salt, and pepper in large mixing bowl. Add potatoes, celery, onion, pickles, and radish. Toss to combine and coat evenly with mayonnaise mixture. Stir in eggs and toss gently. Cover and refrigerate at least 4 hours for flavors to blend. Here we abandon mayonnaise and sour cream, but gain tons of bright flavor from lemon and fresh parsley. Place potatoes in large pot with lid. Cover with water and bring to a boil over medium heat. Turn heat to low and simmer until potatoes are tender (a sharp knife inserted in the middle of a potato will enter easily). Remove the skins from the potatoes. They should slip off easily with the tip of a knife. Chop the potatoes and place in a large bowl. Whisk together the lemon zest, dry mustard, olive oil, and lemon juice. Drizzle over the still warm potatoes. Toss to coat. Add salt and pepper and toss again. Just before serving stir in chopped parsley. Salad can be served chilled or at room temperature. This recipe contains all of the ingredients we love in a fully-loaded baked potato—bacon, sour cream, and chives. Despite my warning that russet potatoes are not the best choice for potato salad, you really need them for this recipe. Russets have a unique flavor that is unmatched by other potatoes. Scrub the potatoes with a vegetable brush then pierce each several times with a fork or sharp knife. Coat each potato with olive oil. Place on foil-lined baking sheet and bake in preheated oven for about 1 hour or until tender. Remove from oven and set aside until cool enough to handle. While the potatoes are baking, cook the bacon in a skillet until crisp. Remove from skillet, drain, allow to cool, and then crumble. Remove the skins from the potatoes and then chop into 1-inch size chunks. Place in large mixing bowl and sprinkle with vinegar. Combine the mayonnaise and sour cream in a small bowl, season with the black pepper, and then add to the potatoes, tossing gently to coat. Stir in bacon, chives, and cheese. Stir again to combine. Cover and refrigerate. This next recipe is an homage to the pasta/potato/pesto dish my family and I enjoyed on the western coast of Italy. I wrote of that amazing meal in my hub "Northern Italian Pasta with Pesto, Potatoes, and Green Beans". Yes, this is a bit out of the ordinary, but the combination of soft potatoes, crisp green beans, and garlicky basil pesto is a perfect side dish for a warm summer evening with chicken or seafood from the grill and a bottle of crisp white wine. Cook potatoes according to directions above. Two minutes before potatoes are done, add green beans—you want them to be crisp-tender. Drain potatoes and green beans and place in large mixing bowl. 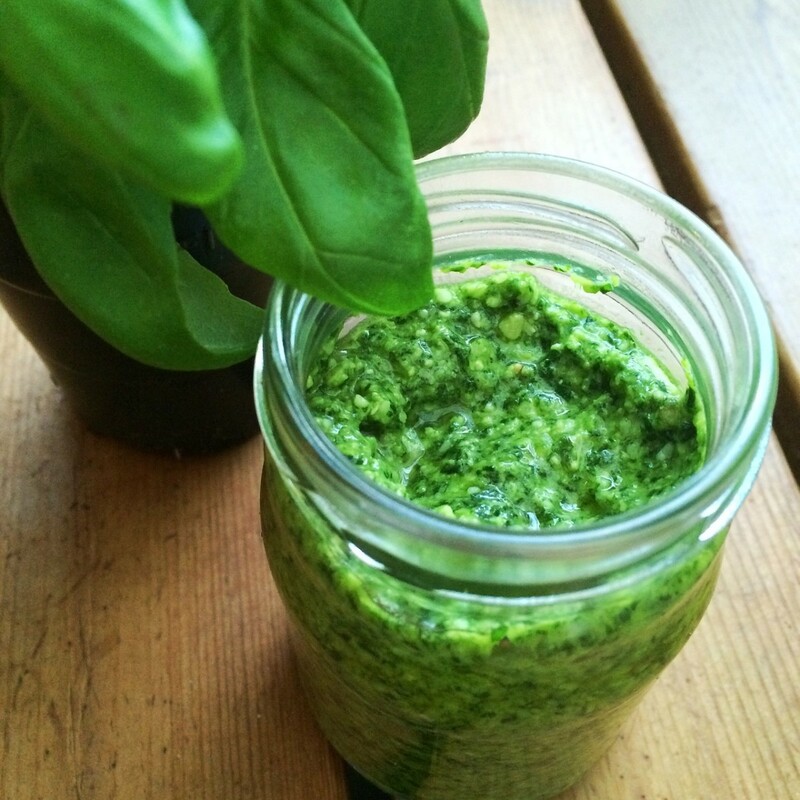 While still warm, add pesto and stir gently to coat. 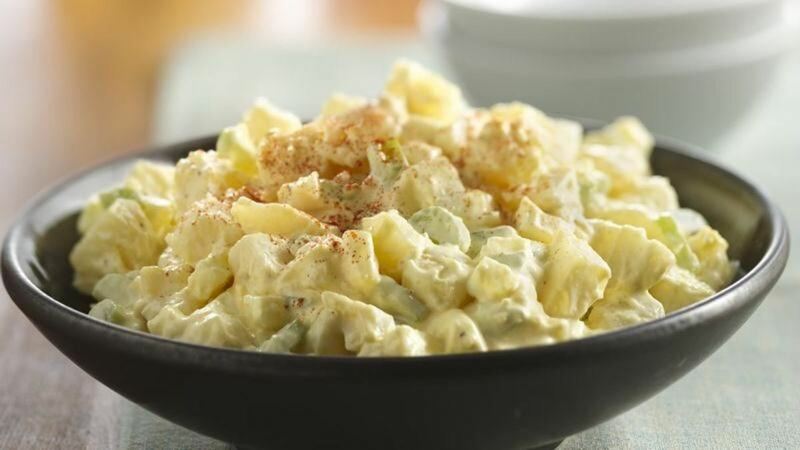 Serve potato salad warm or at room temperature. Top with grated cheese (if desired) just before serving. Please don’t leave! I recognize that unconventional doesn’t begin to describe this “salad” but I make it every year for my family at Thanksgiving. Place Brussels sprouts in medium bowl; add 2 tablespoons of the olive oil. Toss to coat. Spread out in a single layer on baking sheet. Roast for about 15 minutes. Stir and then return to oven. Continue to bake about another 5 to 10 minutes or until sprouts are tender and slightly browned on the edges. Remove from pan and set aside. 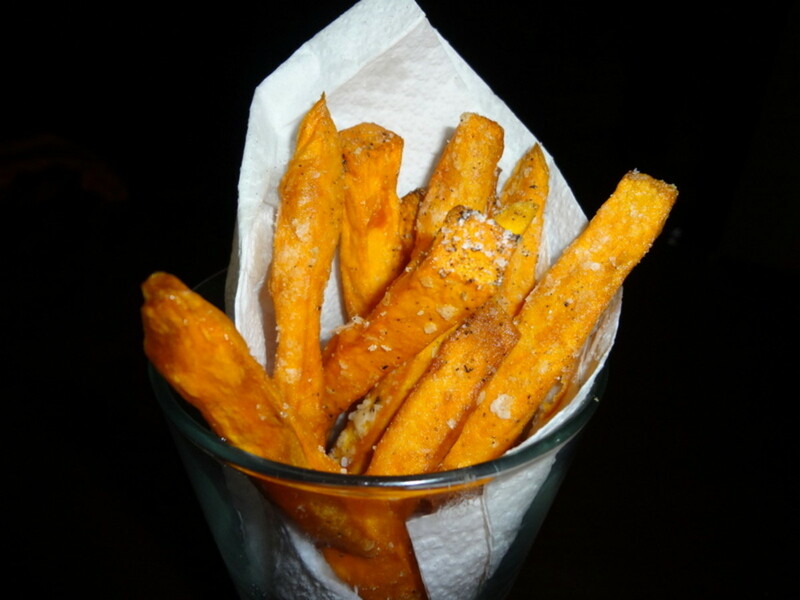 In the same mixing bowl combine diced sweet potato, remaining 3 tablespoons of olive oil. Add the maple syrup. Reline the baking sheet with a clean sheet of parchment paper. 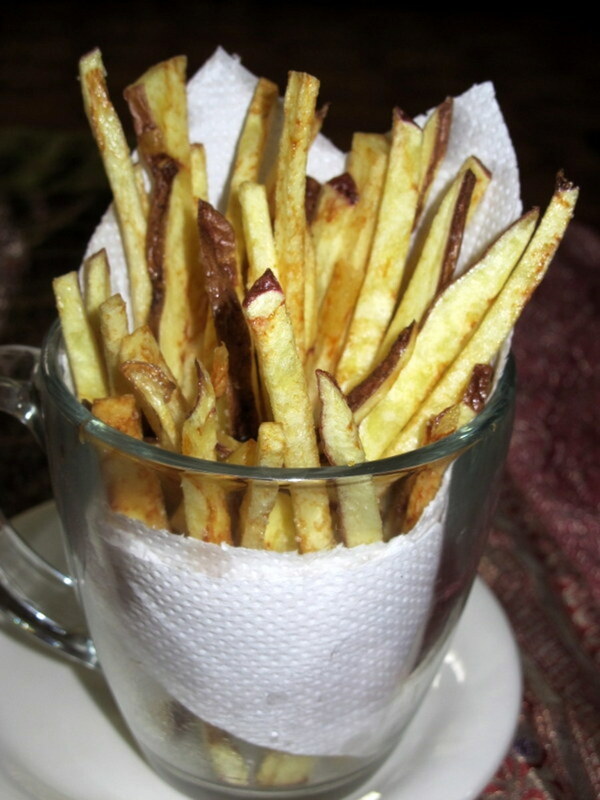 Spread the diced potato out in a single layer; bake for about 20 minutes, stirring once, until tender and caramelized. Remove from pan. In a large bowl combine Brussels sprouts, sweet potatoes, bacon, pecan halves, and dried cranberries. Add rosemary (if desired) and gently toss to combine. Add salt and pepper as needed. 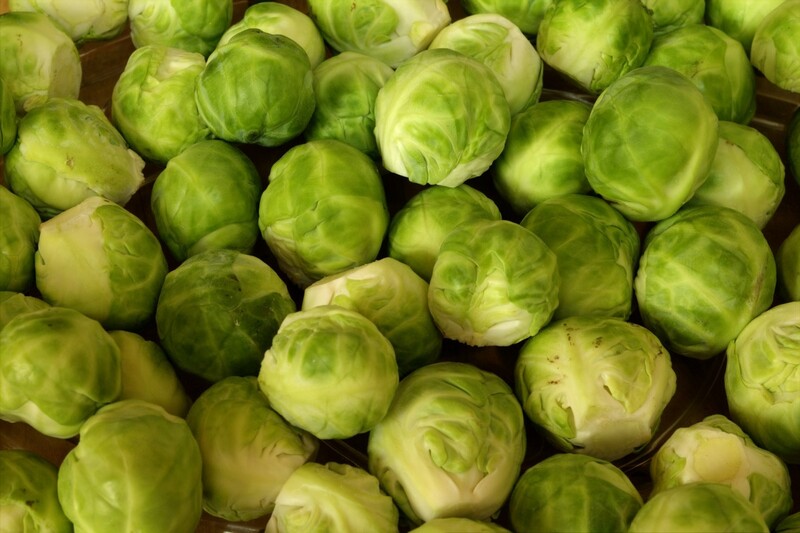 NOTE: When selecting Brussels sprouts, be sure to select sprouts that are all about the same size so that they will cook evenly. Which of these recipes might you use? 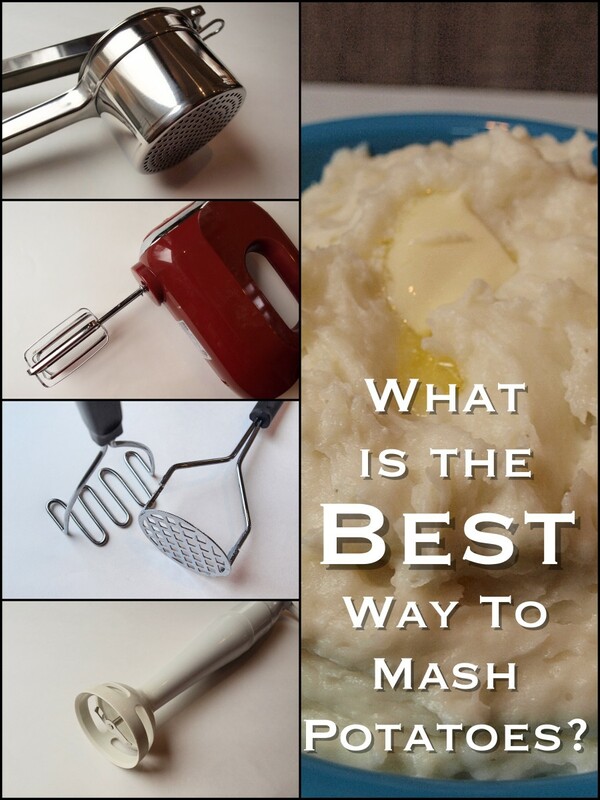 What Is the Best Way to Mash Potatoes? Stacey Harrison, I always love to hear from other foodies--your ideas, family favorites, passed-down-thru-the-generations recipes. Yes, please! We gain when we share with one another. I’d love to give you my recipe. If you’d like? We very well could be, Diva. My family is large enough that I wouldn't be surprised to find a long ago connection! Thank you Bravewarrior - I agree that store-bought potato salad is too soupy--it tend to be more mayo than potato. Mom always sprinkled paprika on top of her salad--and if one of the kids was "helping" she would always caution us to "be sure you use the paprika and not the cayenne pepper." OK, but I never understood why we even HAD a shaker of cayenne. We never used it for anything. I think the more and more that you and I exchange ideas and memories, it seems that you and I must be distant cousins. We're a lot alike. I love potato salad (as long as it's not store bought). Your light lemon version sounds delicious. I always use red potatoes and leave the skins on. I add hard-boiled eggs, scallions, green pepper, celery, dill and sometimes red radish. I don't like my potato salad real wet, so I just add enough mayo and a touch of brown mustard to allow the ingredients to stick. I like to sprinkle paprika on top and let it sit in the fridge for a while before serving. I'll hang on to this hub and give a few of these recipes a try! Flourish - That sounds good. Do you serve it hot like a German potato salad (I am remiss in not including one in this hub) or is it chilled? I like that loaded baked potato salad! I have a honey mustard bacon potato salad that I put together and it's always well received. They're called a 'sweet potato' but they aren't all that sweet, just enough to add depth to a dish. Lawrence - I tend to be a "savory" person, but I know the rest of my family would probably love a combination of white and sweet potatoes in their salad. You might want to give the Brussels sprouts/bacon salad a try. Thanks for stopping by and for your kind words. Only one word to describe this hub. YUMMY!! We often cook a Kumara (New Zealand's sweet potato) with the 'spuds' as it gives a slightly different taste to the salad. Eric - Inquiring minds want to know--is one of these salads in your future? Wow I sure learned alot about potatoes. These sure sound good to eat. Thanks for another outstanding hub. Wow you have some great ideas here! Sweet potato and Brussels sprouts? I would have never guessed it but imagining those flavors together with bacon; I would love to try it.